These qualifications, like our BA (Hons) and BSc (Hons), are designed to give in-depth knowledge and understanding of a particular subject, developing your abilities and problem-solving skills as well as providing practical learning. The Certificate in Higher Education (CertHE) at LSBU is awarded after one year of full-time study on a range of selected courses. On successful completion of the programme, you are eligible to apply through UCAS for entry into year 2 of a full undergraduate programme. If accepted, the time required to complete a Bachelor's Degree is reduced. If you're already in full-time employment, foundation degrees provide the opportunity to continue your professional development in your chosen career while continuing to work. You don't necessarily need traditional academic qualifications to gain entry. 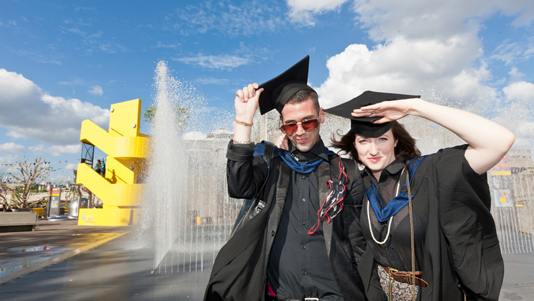 Successful students often progress to a one-year top-up Honours Degree. As an alternative to traditional academic degrees, foundation degrees are designed and delivered in partnership with employers to mix academic study with workplace learning. They equip you with the relevant knowledge, understanding and skills to improve their performance and productivity. Higher National Certificates/Diplomas (HNCs/HNDs) are designed specifically to provide a skills/career based qualification. These vocational qualifications also provide a route onto our Honours degree programmes. An extended degree is a good option for students who do not have the required subjects/grades at A Level (or equivalent) to be able to progress onto a Degree or Foundation Degree programme. School leavers who have passed at Level 3 but in a different subject to the one they want to pursue at university would also be suitable for these courses. This degree programme includes a year of study that ensures students have underpinning knowledge and skills before they progress onto more specialist studies in the later years of the course. It's an ideal entry route for students with few, or no, formal qualifications who are returning to education with some relevant work experience.